Should I buy beer bottles or beer kegs for my wedding? How much beer should I buy for a wedding of 100 people? This wedding beer guide was created to make the process of buying beer for your wedding day simple. Buying and choosing beer for your wedding can be an overwhelming experience. There are many things to consider when it comes to choosing the best beer to serve at your wedding ceremony or reception and if you’re not having a brewery wedding – well, there’s more work for you to do. 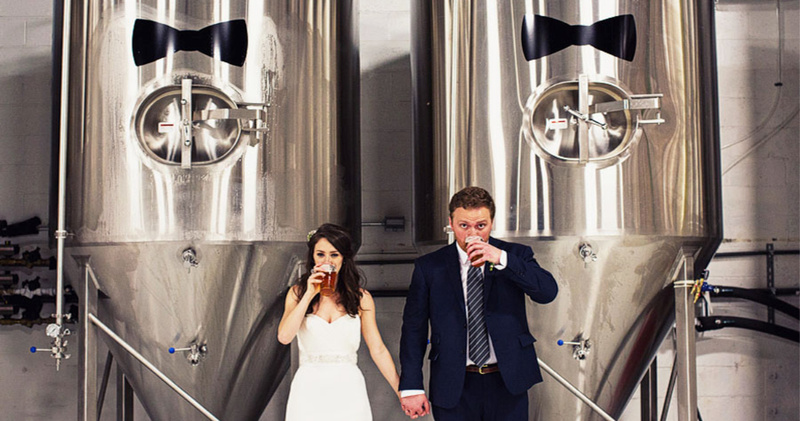 To alleviate some of that stress and make your beer selecting experience simple, we’ve created this “wedding beer guide” to help you select the perfect beer for your big day. This guide will help you figure out which beer styles to serve, what to consider when picking beers for your wedding, how to pair your beer and how much beer you need to buy for a wedding. Make sure your venue has corkage! Many venues have a corkage fee at a cost per head or per bottle, be aware of the fees and restrictions before starting your beer shopping for your wedding. Start your beer hunting early. You’ll want to order your beer in bulk and in advance, to avoid any mishaps and to make sure all your desired beers are available in the quantities you require. How much will beer cost for a wedding? What is your alcohol budget for your wedding? How many guests will be attending your wedding? What’s your headcount? How many guests at your wedding will be drinking beer? Do you have some serious beer geeks on your guest list? Do you have beer geeks on your guest list? Or do you have some people who would prefer wine? How much wine and beer for a wedding? How much beer should you buy a wedding? Generally, you’ll want to calculate 1 drink per guest, per wedding reception hour. However, when it comes to beers and ciders – it’s safe to estimate about 35% of the alcohol consumed will be beer, if you’re only serving beer and wine. If you’re serving cocktails along with beer, wine and ciders, this number will probably be closer to 20%. This could be an overestimation or an underestimation depending on the demand for beer, however, in combination with other alcoholic beverages, this will hit the sweet spot and help you calculate which option is best for you: beer bottles or draft beer. These may seem like rather odd factors to consider when choosing beer, but these factors play into how much beer your guests will be likely to consume, thus the ratios you will need to purchase. If you’re having a summer wedding and your reception is outdoors on a hot day in the middle of July, your guests are likely to lean towards a nice, cold beer. Bottles and cans may be the best option if you’re interested in providing more beer style options and beer variety for your wedding guests. Unless you’re willing to buy 10 kegs of different beers! Individual beer bottles and cans are great because each person can have their own individual can or bottle. However, the cost of beer bottles and cans will generally be higher than a keg, especially if you’re having a big wedding. You can offset this by buying beer by the case from breweries. If decor is a big part of your wedding, beer bottles may be the choice for you. 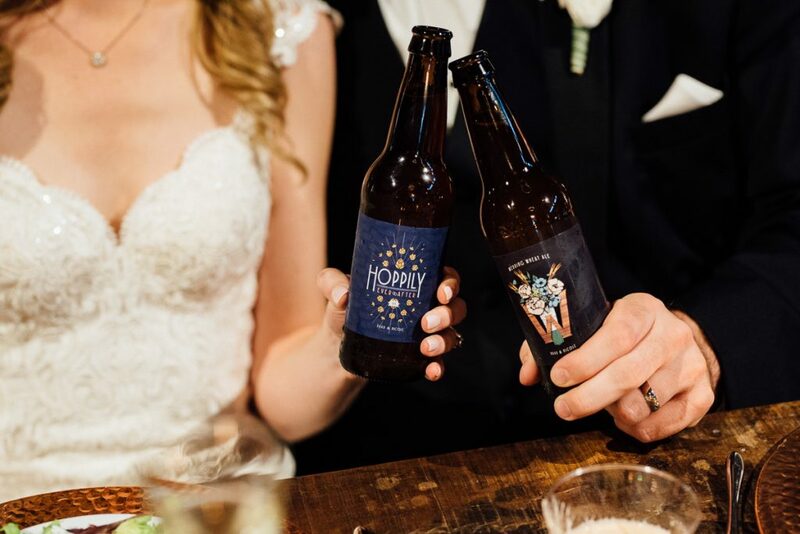 Personalized beer labels have become a popular wedding trend. If it’s important that your guests are drinking out of beer bottles that match your wedding colours and have the bride and grooms initials on them, go for it! If you have leftover beer from your wedding reception, beer bottles allow you to take them home and stick them in your fridge! Or give them away as party favours. Kegs often allow for more wasted beer, so beer bottles are recommended for smaller weddings. While options can be limited, depending on how many beer kegs you are willing to purchase, kegs are a great option for large weddings with many guests. How many pints of beer is in a keg? A sixth barrel keg holds about 15.5 gallons which is approximately 41 pints of beer. A fourth barrel keg (a.k.a pony keg) holds about 62 pints of beer. A full-size keg (1/2 barrel keg) contains about 124 pints of beer. Kegs are a great way to cut alcohol costs for a wedding. Pricing varies depending on the size, brand, beer style and more, but you can fill more glasses for less going the keg route for larger weddings. 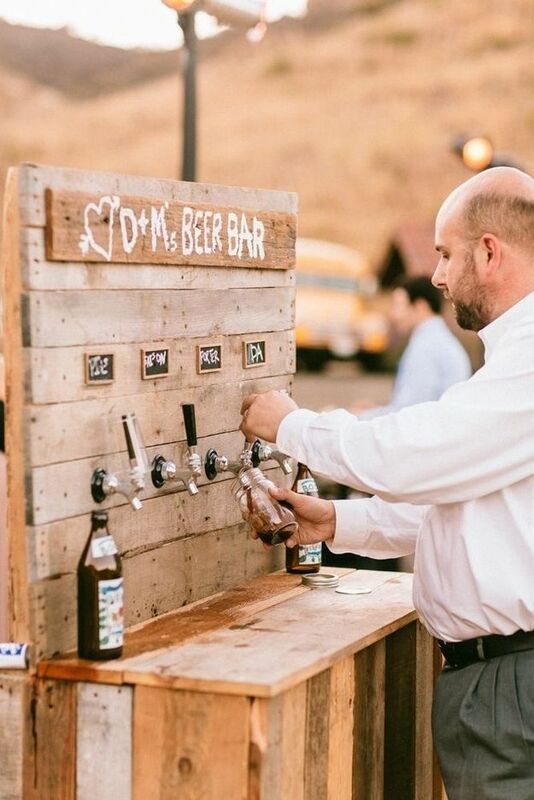 “Beer Bars” are a popular wedding trend, especially at outdoor weddings. Choosing 3-5 beer styles and creating an open beer bar for your guests to fill their glasses may be a way to cut costs and add a unique touch at your wedding. From Europe, Asia, The Middle-East, and Africa, if you want to know how to say “beer” any way other than English…you’ll find it here! Golden Ales & Blonde Ales: where they come from, their appearance, flavour & aroma, palate & mouthfeel, food pairings and serving suggestionss are all explained in this Beer Styles 201 article. Don`t believe that using the proper glass could actually affect the taste of your beer? Try the glass experiment yourself or with a bunch of friends and see. Beer Styles 201: What is a Double IPA (DIPA) & Imperial India Pale Ale (IIPA)? Double IPA & Imperial IPA: where they come from, their appearance, flavour & aroma, palate & mouthfeel, food pairings and serving suggestions are all explained in this Beer Styles 201 article.